Please read below to find answers to many of your questions. How much does a portrait or event session cost? Please contact Erica directly for rates. The deposit is part of your purchase and is deducted from the total cost. Deposits must be made to confirm your appointment. The balance is due the date of the photo session. Do you have a cancellation/reschedule policy? Portraits/Events: If your confirmed portrait or event appointment needs to be cancelled or rescheduled your deposit is valid and can be used towards another EMAZING shoot within 1 year of the original appointment date. Please notify Erica at least 8 hours before your confirmed appointment time to cancel or reschedule. There is a $50 fee (taken from the deposit) if your appointment is not cancelled or rescheduled 8 or more hours prior to your confirmed appointment start time. Please note that your scheduled photo session start time is firm, if you are late your appointment time is not extended. Example; if your 1 hour photo session is scheduled to start at 2:00pm and you arrive at 2:17pm, your appointment will still conclude at 3pm, not 3:17pm. Information regarding the event or type of photos needed; all photo shoot ideas, themes, names & ages of people being photographed, the occasion, special requests, etc. When do I pay? What type of payments do you accept? Deposits are required prior to confirming your appointment. The balance is due on the day of appointment. Cash is preferred (I don’t carry change), debit/credit card and PayPal payments are also accepted. Payments can be made directly on my website; click make payment. No portion of your order will be delivered until the balance is paid in full. $35 fee for returned checks. How many photos will I get in a 1 hour portrait session? A 2 hour portrait session? Please note: Request a price sheet for the specific type of session you are inquiring about (maternity, family, head shots, etc). Indoor photo shoots, newborns or babies and merchandise/products/food items may produce less photos. How many photos will I get in a 1 hour event session? A 2 hour event session? This depends on the type of event and the number of guests. Events typically produce more photos than portrait sessions. Most 1 hour event sessions produce 100-150 edited images. 1 & 2 hour portrait and event sessions can expect preview photos 3-4 days after the session. 1 & 2 hour portrait and event sessions can expect final edits 21 days of the photo session date. Portrait or event sessions lasting longer than 2 hours may take longer to complete. Please note that during peak wedding season & holidays photo processing and completion times may be extended. If an USB flash drive or photo disc is ordered, it will be mailed 1-5 days after the final edits are available. Tracking information is provided via text/email once it has been shipped. Custom photo books, prints and other custom photo items typically take an additional 3-4 weeks. Weddings can expect preview photos within 3-10 business days after the wedding date. The entire photo order (on-line gallery and USB flash drive with images) will be completed 8 weeks after the wedding date. Custom photo books, prints and other custom photo items typically take an additional 3-4 weeks. Please note that during peak wedding season & holidays photo processing and completion times may be extended. If your wedding package will take longer than 8 weeks to complete that will be communicated to you directly. Please see wedding contract for specifics and most up to date information. Will you use photos from my photo session or wedding on social media or on your website? Yes, unless discussed in detail prior to your appointment being confirmed. 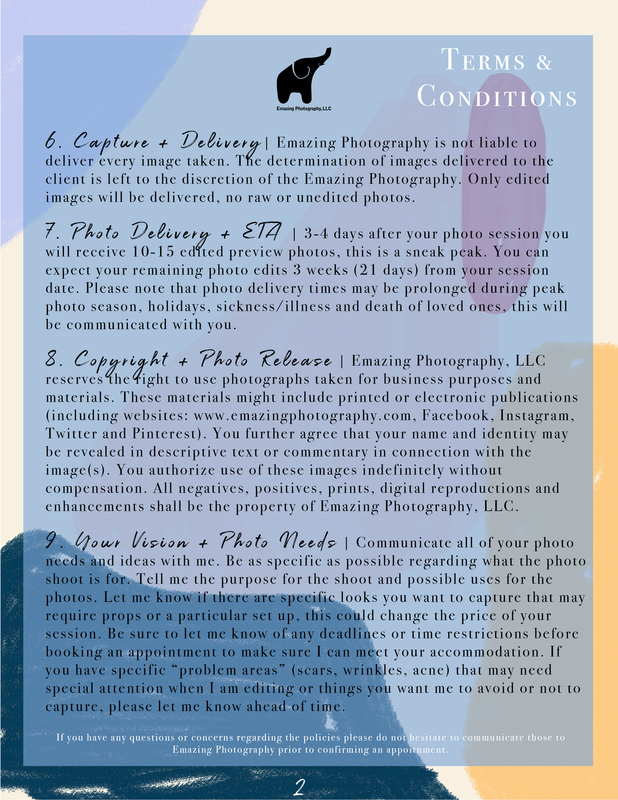 Photo Release Disclosure: Upon accepting & completing a photo appointment with Emazing Photography, LLC you agree and consent to Emazing Photography, LLC reserving the right to use photographs taken for business purposes and materials. These materials might include printed or electronic publications (including websites: www.emazingphotography.com, Facebook, Instagram, Twitter and Pinterest). You further agree that your name and identity may be revealed in descriptive text or commentary in connection with the image(s). You authorize use of these images indefinitely without compensation. All negatives, positives, prints, digital reproductions and enhancements shall be the property of Emazing Photography, LLC. Model, artistic, blog posts and promotional photo shoots on behalf of Emazing Photography, LLC. How do you ship the USB flash drive? How long will it take for me to get my USB flash drive in the mail? The USB flash drive will be mailed 1-5 days after the on-line gallery is available. I ship USPS priority and provide tracking information via text/email. For local Washington residents you will receive the USB flash drive 1-2 days after the shipment date. The USB flash drive is included in all EMAZING wedding packages. Portrait and event sessions do not include a USB flash drive or photo disc. USB flash drives and photo discs can be ordered for an additional fee. My grandmother Betty Jean loved elephants. She had tons and tons of elephant figurines and décor around her home. I love elephants in remembrance of her. I’ve had a passion for photography since the 6th grade (11 years old). I officially started photographing professionally in March 2013. I enjoy outdoor portrait photography the most. I like that you can see change in people over time through photography. Photographing people is more personal and most pleasing to me. Outdoor photos offer a wide variety of natural backgrounds and beautiful natural light. Canon 5D Mark III AND Canon 7D. Why choose Emazing Photography, LLC for photos? My passion for photography is evident in my work. Each photo shoot is personalized and unique and I go the extra mile to make sure each customer has their photography needs met. I try not to completely control the shoot. I like to collaborate ideas for looks, poses, backgrounds, locations, etc. with each customer. While I do like posed photos, I also encourage and like more relaxed/ lifestyle photos. I am very professional and timely and years of customer service experience has really helped me in interacting and satisfying my EMAZING customers! I send preview photos of edited images so that anxious customers can see some of the photos while I am still in the editing stage of their purchase. My customers get a free on-line gallery for 10 years! This includes all of their edited photos online (password protected) for viewing, saving and print ordering. I love this feature because you don’t have to send individual photos to your family and friends, you can simply share the link and password and let them see all of your EMAZING photos! 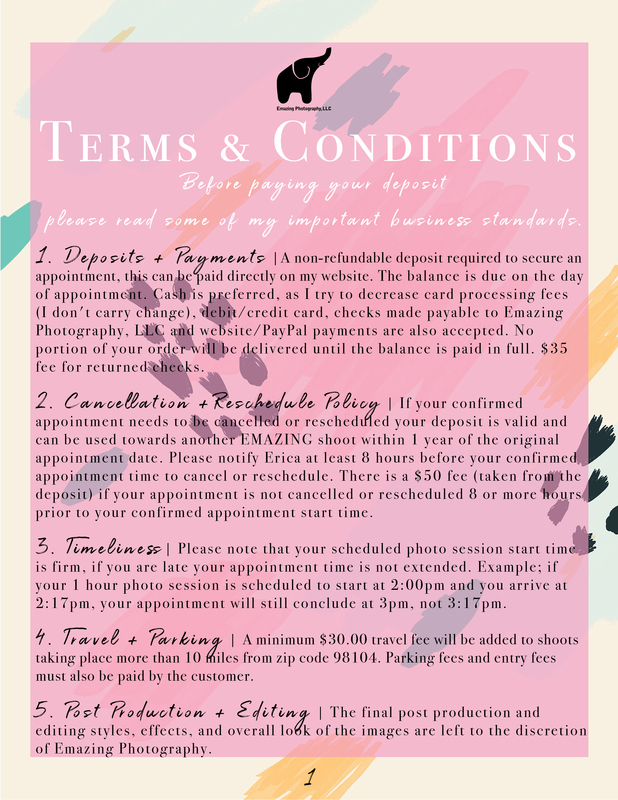 In addition to that, every customer is given a photo release form and can print photos anywhere they would like, as much and as often as they would like. BOOK EMAZING PHOTOGRAPHY! Do you have coupons? Photo shoot giveaways? Specials? Please visit Emazing Photography, LLC ‘s social media sites for the latest specials, coupons, promotions and giveaways. How can I prepare for my shoot? If you are more than 15 minutes late to your scheduled appointment, you may have to reschedule your appointment. I typically book shoots back to back, if you are late your session time is not extended, your session will still conclude at the scheduled time. Communicate all of your photo needs and ideas with me. This includes providing photo ideas that have inspired you. I encourage all customers to send me other photos that they like and let me know what you like about the photos; the pose, the lighting, the editing, etc. Be as specific as possible regarding what the photo shoot is for, the purpose and possible uses for the photos, deadlines or time restrictions, what look and type of photos wanted from the shoot, etc. Also, if you have specific “problem areas” (scars, wrinkles, acne) that may need special attention when I am editing or things you want me to avoid or not to capture, please let me know ahead of time. Location; keep in mind that shady areas are needed for the photos, chose a location that has shaded areas. The location should be chosen based off of 3 factors: 1.The location is in a convenient area that makes sense and works for you and other appointments you may have to coordinate into your session day 2. Your outfit/fashion looks 3. The overall look/feel you want out of your photos. More urban street vibes vs. more nature vibes. Make sure all children are well rested. I suggest scheduling your shoot around your child’s nap time. Every participant (adults included) should be well rested with a positive attitude. This will enhance your photos. It’s important to inform children about their upcoming photo shoot and let them know what is happening. Getting them excited about the shoot will prepare them for the session. Encourage smiling, kissing, hugging, fun and affection. Adults should also connect and be present emotionally and physically. Closeness and affection will make for loving photos. Feel free to bring a family member or friend to the shoot with you. They can help carry your personal belongings and make children laugh. Makeup, hair and fashion styling is very important. Because of the high quality technology I use, my camera will capture everything. Its best practice to have your makeup done professionally or apply makeup to conceal problem areas, acne, scars, etc. Hair being freshly styled, in place and well-kept will also make for better photos. Clothing that is comfortable yet stylish is preferred. Don’t forget to bring additional lip stick/lip gloss/lip moisturizer, lotion, hair comb/brush, etc. Bring additional clothing looks if your session time allows for outfit changes. Accessorize; bring a hat, scarf, sun glasses, jacket, etc. Simple apparel additions can enhance and change your photos, giving you more variety in the shots. Bring props or things that are important to you. Incorporating special items into your photos can make for special, one of a kind photos. Example: High school seniors may bring a class ring, school jacket, sports equipment for a sport they participate in, books, etc. for their senior portrait session. A mommy to be may bring baby shoes, an ultrasound photo, baby clothing, etc. for her maternity shoot. Engaged couples can bring a save the date mailing, engagement ring, pet, etc. to their engagement session. Planning ahead and being organized with everything needed for your shoot (clothing, hair, makeup, locations, etc.) will help you get to the shoot on time. Allowing plenty of time between hair and makeup appointments is encouraged. Be open minded and willing to try new things. Things that may seem silly can make for fun and unique photos. Please pay your balance due in cash if possible. The balance due is due on the day of the photo session. PayPal and my mobile debit/credit card readers take a percentage of the transaction, I try to avoid these fees. Be ready to have fun. Laughing and movement is encouraged. Don’t get caught up in being posed, be natural and free. Enjoy the moment! I started liking photography because it was fun, I want to keep it that way! I am a pretty easy going photographer. I like posed photos, but I really enjoy natural authentic moments. I like to capture people doing ordinary lifestyle things, enjoying life, creating memories with family and showing love that I can capture in a photograph. I collaborate with my customers, I do not control the entire shoot. I am always open to my customer’s ideas and needs for the shoot. I love colorful vibrant photos, as well as classic black and white photos. Laughter photos are always special to me because the smile is natural and the photo shows so much joy. It’s important that I capture closeness, love and affection among loved ones.